UPDATE: Added more information to the batch. The Booster Pack for the start of the next season and the new Shadow Paladin Trial Deck. For those just following us, this Trial Deck is centered around Shadow Paladin, and its title is 竜魔道の儀式 Ryuu Madou no Gishiki. Which is loosely translated as “Dragon Sorcery Ritual”. The Deck is used by a new character introduced in “Cardfight!! 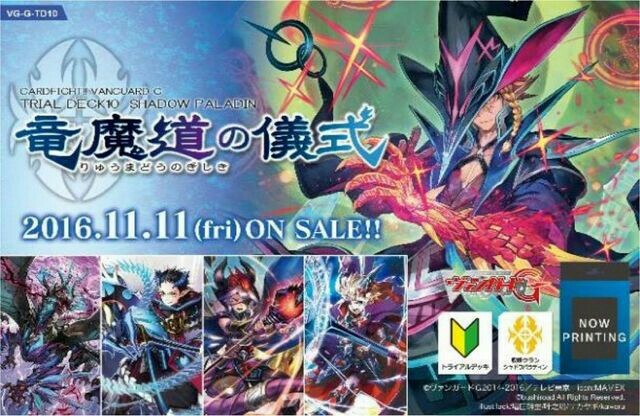 Vanguard G NEXT”, the next season of Cardfight!! Vanguard to air after the conclusion of the “Stride Gate” story arc. Details about the character are currently unknown. The New Booster, G-BT09, for those concern is titled 天舞竜神 Tenbu Ryuujin (Sky Dancing Dragon Deity). 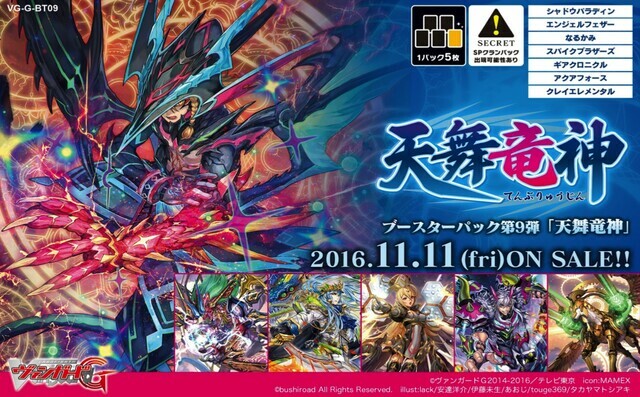 This set is the first set for the season “Cardfight!! Vanguard G NEXT”! It covers cards from the beginning of the G NEXT Story Arc. There is also further support for the cards that are reprinted! Other SP Packs are Shadow Paladin, Narukami and Spike Brothers making a total of four different SP Packs!